Location Lighting with Drew Gardner » Развлекательный портал Jolly Roger Project. A visually stunning, action-packed educational DVD to inspire and inform photographers wishing to learn more about outdoor location lighting. Join photographer Drew Gardner as he takes viewers behind the scenes on major location photo shoots and produces technically stunning images with expert use of light, lighting equipment and special effects. 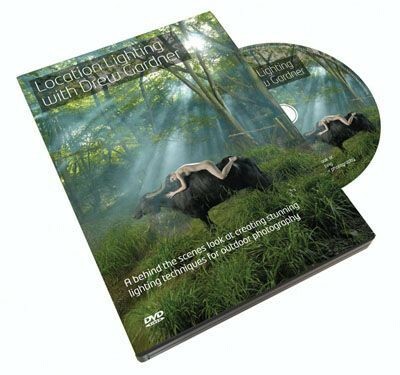 This unique reality style DVD is aimed at professional and amateur photographers looking to improve location lighting techniques. Shot totally on location, Drew shows the challenges of creating fantastic lighting effects as he photographs beautiful models, a badger, and a water buffalo in stunning forest settings, it gives an insight into the inspiration, thought process and post production which go into these remarkable epic location shoots. Drew says: 'When I talk about shoots I've been on, many people say they wish they could come along. This DVD is a way ot inviting them on set and seeing what is achievable. It is instructional, educational, a little quirky and fun. There is a high level of instruction which is transferable, even if using a modest lighting set up. I wanted to show people photography is exciting. I didn't want to do a more traditional lighting guide in a white studio talking about conventional lighting set ups. This is something completely different. Filled with practical shooting tips, Drew gives advice on using the Elinchrom Ranger autonomous lighting system and accessories, his favoured brand of equipment for his epic shoots. Drew also demonstrates how to process the images and post production techniques using Phase One's Capture One Pro Version 4, which he describes as 'in my opinion, the best raw imaging software out there on the market.